Twin reversed arterial perfusion sequence (TRAP sequence) is also known as “acardiac twin”, and is a specialized condition that occurs only in monochorionic twin fetuses, in 1/35,000 of all pregnancies. The condition occurs when one twin develops normally, but the other twin has no heart due to developmental anomalies. 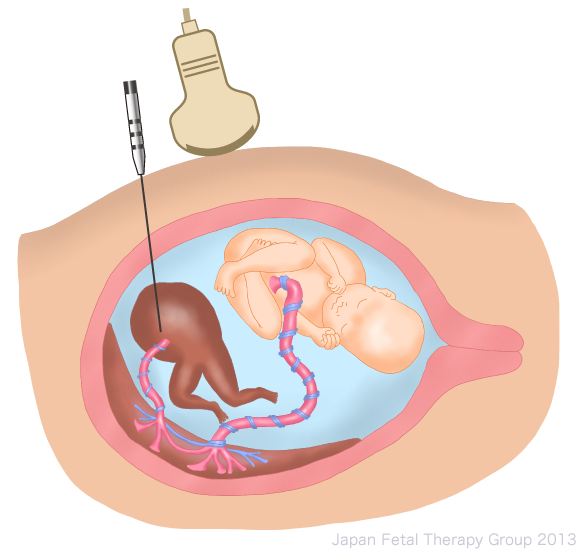 Since in monochorionic twin fetuses both twins are connected to the placenta by their own blood vessels, the twin with the heart (the pump twin) supplies blood to the acardiac twin via the anastomotic vessels of the placenta and the umbilical artery, resulting in a situation in which the pump twin is effectively raising the acardiac twin. For this reason, the acardius grows large, causing the blood flow to increase within the acardius such that the burden on the heart of the pump twin grows even further, to the point where the pump fetus experiences cardiac failure. If the situation continues to this point, the pump twin produces an increased quantity of urine, leading to polyhydramnios, which can cause rupture of membrane or the onset of labor, as well as fetal edema caused by cardiac failure. Without treatment, it is extremely difficult to rescue the pump twin, who would otherwise develop healthily, and approximately 50-75% die. As a result, this condition is a particularly strong candidate for fetal therapy1). It is believed to be caused by an abnormality occurring during the splitting of the egg in cases of monozygotic twins. TRAP sequence is diagnosed using an ultrasound examination. A diagnosis is reached by confirming blood flow to the acardiac fetus via the umbilical cord. The examination finds no heartbeat in the acardius and as a result, in early pregnancy, care should be taken because the diagnosis can simply be fetal death in one of the twins. In such cases, acardius is only diagnosed when it is noted that the twin supposed to be dead is in fact growing as the pregnancy progresses. At the same time, from mid-pregnancy onwards, the condition is sometimes diagnosed from the particular shape of the acardiac fetus. Since reports suggest that 9% of pump twins have concomitant chromosomal abnormalities2), not only the cardiac function of the pump twin, but also the presence or otherwise of other formational anomalies should be closely studied. There is still no consistent opinion with regard to which type of TRAP sequence cases require fetal therapy; however, in general, it is considered necessary where symptoms of cardiac failure or polyhydramnios are noted in the pump twin, or where the acardiac twin is noticeably bigger than the pump twin. At the same time, some are of the opinion that, if less invasive therapies are possible, all cases of TRAP sequence should be treated, regardless of their level of severity3). Various reports have been made of fetal therapy methods for TRAP sequence4)-6). From the perspective of completely improving the condition, the major treatment methods involve using a range of methods to occlude blood flow from the pump twin. Broadly divided, there are two types of methods for occluding blood flow. The first is to occlude the blood flow from the umbilical cord7)-10), while the second is to occlude the blood flow within the acardiac fetus 3)11)-14). Occluding blood flow within the acardiac fetus using radio waves is low-impact and can be implemented using a relatively simple technique. As a result, it is providing increasingly positive results in treatment and has become the main technique currently used in Japan (Fig. 1). In 2007, Hanmin et al. reported achieving an 86% survival rate in 29 cases of treatment using radio waves14). Given these treatment results and the frequency of complications, it is believed that treatment using radio waves will continue to be selected in many future cases in Japan.